Prof Rener Gracie chose Seattle, WA. to host his first 'Super Seminar' a couple of weekends back on May 31st. Four seminars back to back to back to back, where Rener treated well over 80 participants per session to his patented good humored teaching style. One thing that I noticed this year is that Rener is really showing his maturity both in the depth of his grappling knowledge, but more importantly via his teaching style. I have tried to support any and all events Craig Hanuami hosts in town, and by going to Rener with my student and friend Lara it enabled me to wear a bit of a different hat then previous years. I went as a teacher and observed Rener with my "coaching" eyes and what I saw was a man growing into a well seasoned teacher. After all taking on a full day of multi-topical seminars is quite the daunting task in and of itself, but more difficult is the ability to walk the line of information overload with participants. We decided to attend the first and last seminars; Cross Choke Mastery and Self Defense respectively due to our interests and time constraints. 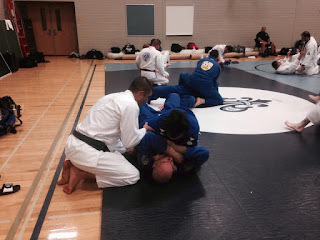 Cross Choke Mastery was the first seminar of the day and right off the bat I noticed a difference in Rener. Don't get me wrong there was still his patented command of the room and warm personality, but a calmness has entered his voice that I can only equate with a wisdom and comfortableness in the environment he is teaching. An attribute many of us would foolishly assume comes with teaching hundreds of thousands of hours on the mat, but let me tell you that this engaging energy does not just happen. It is something cultivated and honed. What I am saying is Rener Gracie has worked very hard on becoming an excellent instructor and now more then ever it shows! Dealing with people is difficult. Teaching adults can be damn near the most challenging endeavor one can embark on. Rener not only controls a room but engages each individual and goes out of his way to make the technique(s) as fundamentally basic as he can. I did not say simplify, but rather break each movement down to its core and make sure that even the newest white belt understood the principle conveyed. I listened in as he helped others around us and his voice and calm demeanor do nothing but help students learn. Rener assisting Lara in the procurement of my lunch money! Technique wise he methodically progressed from "This is a cross choke" to strategies in getting the choke set up. Cross chokes are incredibly difficult for me to get at all, and the details offered in Rener's 90 minutes certainly have put me in a better position these last two weeks though I must admit I have not nailed a successful cross choke as of yet, but I am maintaining mount much better! We came back about 6 hours later for the Self Defense course and after adjusting to the wet rag of air welcoming our arrival to an oxygen deprived gym Rener kicked off the last seminar of the day. The physical exhaustion showed both on teacher and students alike but Rener was steadfast on his course and did an excellent job keep the energy and techniques flowing. I would venture to say this session was a bit more scattered then the earlier one but that also may have been due to more varied questions being asked on such a broad subject. For those who were brave enough to stick out the entire day, it was showing. 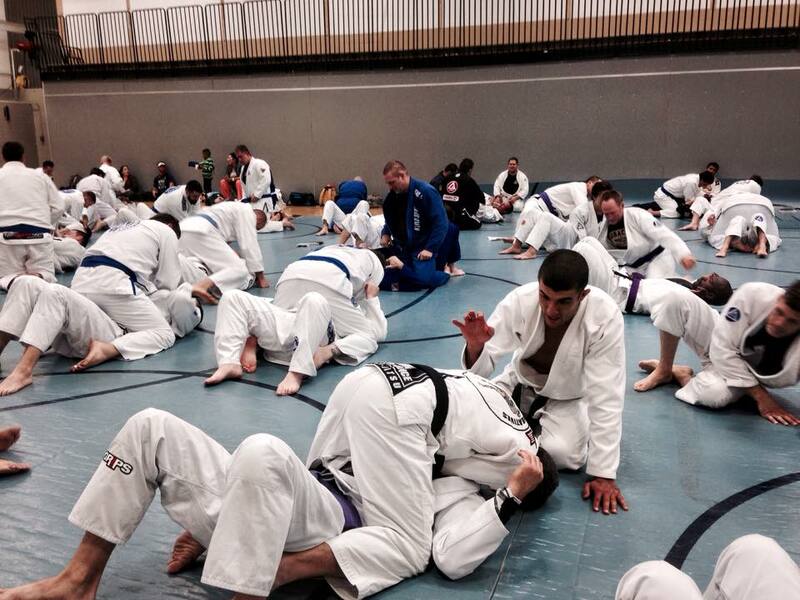 Physical exhaustion was trumped solely by mental fatigue especially on the white and blue belts. 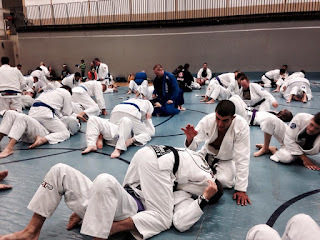 This is where you see seminars/teachers crash and fail, but as always there is Rener carrying the crowd on his shoulders and keeping energy levels high where he shared a handful of essentials when it comes to defending oneself. A bit different then what I have been taught I thought this seminar gave a great peek into the world of Rener's grandfather Helio Gracie. 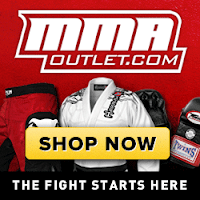 After all self defense IS why Helio created Brazilian Jiu Jitsu, and for the most part many of the techniques were taught as Helio has passed them down from one generation to the next. The sole criticism I have is the final drill on Sunday the "Zombie Attack Drill" was not well received by the majority of the female contingent I noticed. My partner asked me to stay and not allow other random folks to be jumping in and working, and I noticed the majority of females and their partners (male or female) were opting out. Such drill where we change partners every few seconds have been, in my experience, poorly received especially at seminars as folks are quite leery about the training partners they choose. Food for thought for future seminars. Once again I cannot encourage you enough to train with Rener Gracie if the opportunity even remotely arises. I am not sure I would suggest a 6 hour marathon simply because your retention rate will tank well before even the 5th hour, but getting on the mat with this man needs to be on your grappling bucket list. I cannot thank Craig for giving me the opportunity to train with Rener way back when I was a blue belt to now (I owe you a thousand private lessons!!). Big thanks to my partner Lara, the seminar was a blast as was working with you. And last but certainly not least a huge thanks to Rener who took time to visit us though he has a little bambino on the way (best of luck to you and your family). We really appreciate your tutelage and time at such an important crossroads in your life. Something in the air this summer... we have not one, but two of the Machado brothers featured in articles this month! 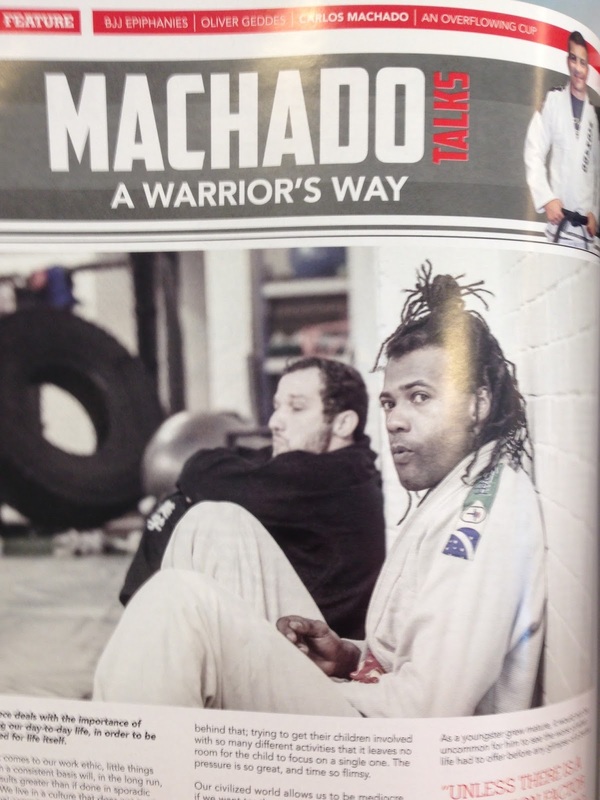 Prof Carlos Machado offers his mat wisdom in a monthly column with Jiu Jitsu Style Magazine where he shares how to practice jiu jitsu both on and off the mat. Jiu Jitsu Style is the leading magazine for our sport so pick one up today or get a digital subscription and check out what Carlos has to say every month. Our friend Professor Jean Jacques Machado has a feature in this months Jiu Jitsu Magazine specifically on how to attack the turtle position via a series of chokes. Two things I love about this article... one is the variety of chokes JJ offers, with variations I have not seen other places. And the other is the constant inspiration Jean Jacques Machado offers all of us where a man with virtually no fingers, nor a functioning hand, can specialize in a variety of collar chokes. He never let his birth defect EVER slow him down not hold him back. Respect.